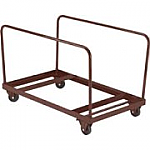 Handtrucks2go is proud to bring you a great choice of different table dollies. However many chairs you have to move, whatever type, or what ever your budget, we got you covered! 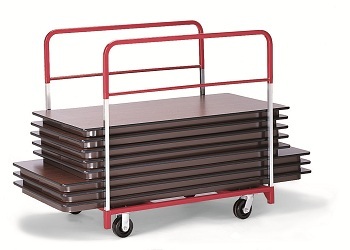 Round Folding Table Cart for Tables Up To 60"
Holds 42 chairs and 8 Tables! Holds Up to 42 Chairs and 8 Tables! Fits 8-10 48" and 60" Round Tables. 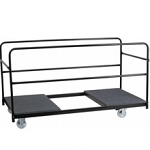 Great Table Dollies Available For The Best Price Only Here At Handtrucks2go! Do you constantly need to transport and carry large quantities of folding tables with varying sizes around your working area? Well look no further for Handtrucks2go is here to make it easy for you. Introducing our wide selection of Table Dollies designed to make the moving process done in your business so much easier. These dollies specialize in accommodating all sorts of tables that are normally hard for a single person to carry alone. Some dollies are suitable for round tables in an upright position while others are designed to hold rectangular tables stacked on top of one another. 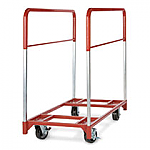 We also have heavy-duty dollies that are constructed for rough and ragged material handling applications. With the help of our table dollies, you can move around and position tables more efficiently and effectively which allows you to cut your setup and break-down time in half or even the less than that. You can find numerous Table Dollies all made from top and well-known manufacturers such as Ace, Raymund Products, Table Totter and more! The mentioned manufactures have been in the material handling industry for a long time and are committed in giving you high-quality and top performing products at amazing deals and prices so don’t be afraid in purchasing one Table Dolly for yourself right now! Each and every one of our table dollies have various unique features that are designed to hold specific table models, shapes or sizes so please take your time in reading our descriptions and specifications of our dollies. If you want to ask for help in choosing the best Table Dolly suited for your business, please call our experts at (888) 811-5941 who are more than willing enough to assist you and answer any questions you may have with regards to our products.